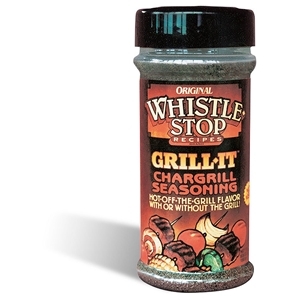 Whistle Stop Recipes Grill It Chargrill Seasoning adds a chargrilled flavor to meats and vegetables cooked in your oven or on the grill. Use as a rub or shake on during cooking. At the dinner table sprinkle on your favorite dishes to add a delicious chargrilled flavor. Great for potatoes, salads, vegetables and popcorn, even corn on the cob! We often used it instead of salt and pepper. We've used this for years. Love this seasoning!